I'm back! Save your lectures, I know that I've been a terrible blogger. I've been trying to get into the swing of things with my new job where I'm actually in an office all day long, five days a week. This "single-working-mother" thing is hard, y'all. So I don't really have too terribly much to update. Other than the fact that my daughter could not possibly be any cuter. I realize that there may be a fair amount of bias on my opinion, but I submit the following evidence. You go ahead and tell me you don't agree. Go ahead and try. Last night was one of the very best nights that Ruby and I have ever had. She was still napping when I got home from work, so I quickly got dinner in the oven and paid some bills before she woke up (in other breaking news, I have not yet won the lottery). When Ruby typically wakes up from her nap, her mood will either go towards one extreme or the other. She will either wake up with her little halo and angel wings on, or she will have sprouted horns and a forked tail - she's lucky she's cute.... Yesterday was definitely the halo and angel wings. After dinner we walked up to the ice cream shop on the corner since she had definitely earned this treat from her good behavior. 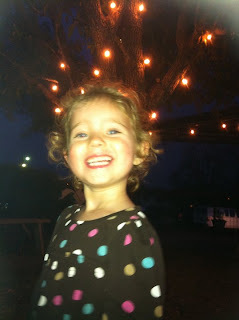 We played in their courtyard and Ruby enjoyed her lemon frozen custard. It was a beautiful evening and we were both so happy. The rest of the night was uneventful, but was still just as fun. Bathtime, followed by books, snuggles, and finally bedtime. How did I get so lucky? Watch me prove you wrong.